Gilla mo-Chaidbeo, abbot of the monastery of Paul and Peter in Armagh. The tower of piety and firmness, wisdom and knowledge, labour and prudence of his time. THE AGE OF CHRIST, 1174. Gilla Mochaibeo, Abbot of the monastery of SS. Peter and Paul at Armagh, a diligent and faithful servant of the Lord, died on the 31st day of March, in the seventieth year of his age. Although the oak-tree's trunk cease for a time to put forth branches and leaves, its roots do not fail to grow vigorously, while they extend in the earth. So when religious life appears diminished to the gaze of men, its hidden workings do not present less effective results, in the sight of God. St. Machabeo, or, as he is sometimes called, Gilda Machai-beo, means, "servant of the living Mochai;" and, Colgan, who has given an account of him, at the 31st day of March, supposes the name to have been imposed, in honour of St. Mochai, Abbot of Nendrum, who is related to have lived one hundred and fifty years, in Heaven, and in a state of repose. The present saint was born, in the year 1104, as we collect from the Irish Annals. He embraced the monastic profession, in the city of Armagh, and, in its former monastery, consecrated to St. Peter and St. Paul. He was probably a student, with the great St. Malachy O'Morgair, and under the tuition of that holy Abbot, Imar O'Aedhacan. It is also probable, that our saint succeeded this latter, by governing the monastery, after his death, in the year 1134. The office of Abbot he exercised—if this opinion be well grounded —during forty years, with the greatest sanctity. According to our ancient Martyrologies, he was the tower of Devotion and of Mildness in his time, the Ark of Wisdom and of Science, of Labour and of Prudence. He is also one of the latest saints, recorded in the Martyrologies of our country. He died, on the 31st of March, in 1174, having attained the seventieth year of his age. We find mentioned, on this day, in the Martyrology of Donegal, Machabeus, i.e. Gilla Mochaidhbeo, Abbot of the Monastery of Peter and Paul at Ardmacha. The Bollandists briefly notice him, at this date, but they print, incorrectly, MCXXXIV., as the year for his death. St. Colman, Son of Ronan. The Martyrology of Tallagh, at the 30th of March, records the entry of a St. Colman. The name of this saint appears twice repeated, in the published version. This is not the case, in the Franciscan copy, preserved at the Convent, Merchant's-quay, Dublin. According to the Martyrology of Donegal, likewise, on this day was venerated, Colman, son of Ronan, son to Loarn. He descended from the race of Conall Gulban, son to Niall. We know little more regarding him. St. Aedan, or Aedhan, of Derrybrughas, County of Armagh. The Bollandists, on the authority of the Martyrologies of Tallagh and of Marianus O'Gorman, place the festival, Aidanus de doire Bruchaisse, at the 29th of March. 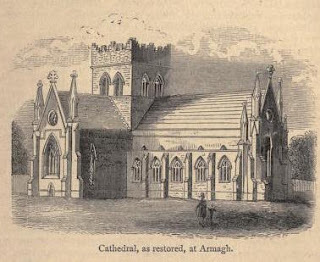 Aedan Dairi Brucais is now known as Derrybrughas, alias, Killyman, in the County of Armagh; and, at his church, which seems to have existed from the seventh century, the present saint was venerated. An entry occurs, in the Martyrology of Tallagh, at the 29th of March, Aedan Dairi Brucais. St. Edan, Bishop and Confessor, was venerated, at the 29th of March and, formerly, he had an Office of nine Lessons, as we learn, from an old Kalendar. We read, in the Martyrology of Donegal that on this day was venerated, Aedhan, of Doire Bruchaisi, or Doire Bruchuse. 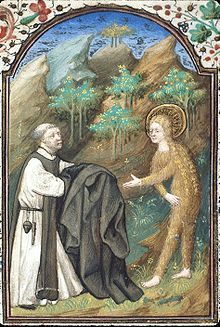 March 28 is one of the commemorations of the female ascetic, Saint Mary of Egypt, c. 344-421. This was the date at which her feast day was entered in the Hironymian Martyrology, a possible source for the Irish Martyrology of Tallaght, even though the feast does not appear in the Irish calendar. Saint Mary's feast is today celebrated by the Orthodox on April 1, according to the 1913 Catholic Encyclopedia it is entered in the Roman Martyrology on April 2 and the Roman calendar on April 3. I. Incipit uita Mariae Aegyptianae, that is Here beginneth the life of Mary of Egypt. When the Lark ceases her singing at eventide her heart mourns for the day in sadness and sorrow; for she hath no love or liking for the night but is lonely for the day all the while. Even so the man who has no pleasure [?] in praising another but regards his good deeds and disdains his virtues; that man is lonely for the great glory compact of glories, the noble house of Heaven, where is life without death, love without darkness, cheer without gloom and all other glories besides. For tongue cannot tell, nor eye attain, nor ear receive, nor heart mediate the glory of that house; and he who is not in deadly sin will have his share of that glory. No man can sleep or rest, sit or stand, fast or feast, without sin; but, O mortal, if thou sin, be not downcast and despairing of God’s mercy, but make confession quickly afterwards and God will forgive thee thy vices. For consider how Peter sinned, and Paul and Longinus and Mary Magdalene and Mary of Egypt and many others likewise; yet these were all saved after repentance, since God longeth more for the sinner to pray that his sins may be forgiven than doth the sinner to obtain forgiveness. It is the sight of this extraordinary creature which forty-seven years later confronts the monk Damsosmais, he commands her in the name of Christ to stop as she flees from him and she tells him her story. The Life ends with Damsosmais discovering Mary's body in the following year. He buries it with the assistance of a lion, no less, an episode also found in the original Life from the east. The lion helps to dig a grave and whilst the man takes the head of Mary in his hands, the big cat 'took the feet of the holy woman in his fore-feet, and together they laid her in the grave and the lion quickly covered her up with earth'. There is also a rather touching detail added of the parting of these strange mourners: 'Then the lion gave a kiss of peace on the monk's feet and the monk blessed the lion and the lion went his way into the forest fastnesses....' The monk then returns to his community and shares the salutary tale of Saint Mary with them. I am glad that the scribe Uilliam Mac an Leagha shared it with the people of Ireland too, albeit with a few embellishments to an already strange tale! A. M. Freeman, 'Betha Mhuire Eigiptachdha', Études Celtiques, Vol. I (1936), 78-113 in Máirín Ní Dhonnchada, ed., The Field Day Anthology of Irish Writing, Vol. IV, Irish Women's Writings and Traditions (Cork University Press, 2002), 143-148. And though all feasts fully deserve their celebration and honour in these three ways, still more does this festival; for in it is the assembling together of the folk of heaven and earth; it is the festival alike of the Old and the New Testament; it is the peculiar feast of the heavenly Father; the feast of the Lord's resurrection; the feast which surpasses all others; the honoured and venerable festival of the people of heaven and earth, is this festival of Easter. For many are its wonders and marvels: in it the angel passed over the houses of the children of Israel, when he slew all the first-born of Egypt; in it the people of Israel went forth from Egypt, to go up to the land of promise; in it Christ arose from the dead, after binding the devil in hell; in it the souls of the holy and righteous of the five ages of the world came out of hell into paradise; in it will be the famous day, the Day of Judgment. Homily XIX, 'On the Resurrection' - The Passions and the Homilies from Leabhar Breac - Text, Translation and Glossary by Robert Atkinson (Dublin, 1887), 390. There were seven men dwelling in Magh Sgiath, who frequently saw the fiery globe which it has been already told they first beheld at the time of Declan's birth. It happened by the Grace of God that they were the first persons to reveal and describe that lightning. These seven came to the place where Declan abode and took him for their director and master. They made known publicly in the presence of all that, later on, he should be a bishop and they spoke prophetically:—‘The day, O beloved child and servant of God, will come when we shall commit ourselves and our lands to thee.’ And it fell out thus (as they foretold), for, upon believing, they were baptised and became wise, devout and attentive and erected seven churches in honour of God around Magh Sgiath. Once on a time Declan came on a visit to the place of his birth, where he remained forty days there and established a religious house in which devout men have dwelt ever since. Then came the seven men we have already mentioned as having made their abode around Magh Sgiath and as having prophesied concerning Declan. They now dedicated themselves and their establishment to him as they had promised and these are their names:—Mocellac and Riadan, Colman, Lactain, Finnlaoc, Kevin, etc. These therefore were under the rule and spiritual sway of bishop Declan thenceforward, and they spent their lives devoutly there and wrought many wonders afterwards. P.Power, ed. and trans., The Life of Saint Declan of Ardmore, (London, 1914), 15, 23. March 6 is the commemoration of a group of County Dublin holy women, the Daughters of Leinin. 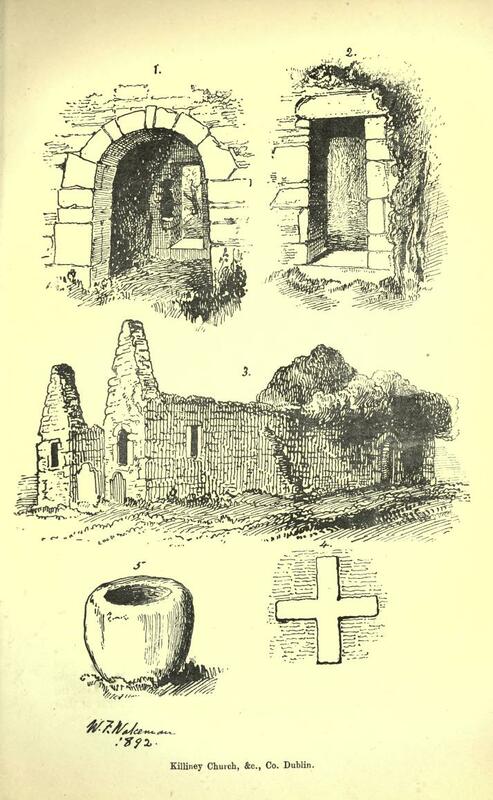 Canon O'Hanlon's account of them can be found here but below is another nineteenth century account, this time of the church that still bears their name at Killiney. It was one of the places visited on a field trip of the 1890s to sites in the greater Dublin area. I have reproduced the accompanying figural illustrations from the Journal of the Royal Society of Antiquaries of Ireland. It would be interesting to know what more recent archaeological opinion has to say of the dating of the church and the claimed Syrian parallels for the engraved crosses found at this and other Irish sites. The name of this place, originally written Cill-Ingen, or Cill-ingen-leinin, as explained by Dr. Joyce, refers to certain daughters of Lenin, five in number. Though the father is said to have been a person of high position, and even of royal descent, we know nothing further of him, nor of his daughters, except that the latter are recorded to rank amongst the saintly women of Ireland. They appear to have flourished some time in the seventh century of our era. Whether the older portion of the existing ruin belongs to their time, or is of their foundation, it is not necessary here to discuss; but Petrie, in his great work on the "Ancient Architecture of Ireland," pronounced his opinion that it must be assigned to the sixth or seventh century. At any rate the church belongs to two distinct and widely separated periods, and, in an examination of the ruin as it stands, the student of Irish ecclesiastical architecture will find an interesting and highly instructive study (see fig. 3, p. 409). The original building, except wanting a roof, is still almost entire. It consists of nave and chancel connected by a semicircular arch, truly Roman in character, though the jambs of course incline in Celtic style (see fig. 1, p. 409). The extreme dimensions of the church upon the interior are 85 feet; the nave measures but 12 feet 8 inches, and the chancel 9 feet 6 inches, in breadth. In our Journal, Part 2, vol. ii., Fifth Series, Second Quarter, 1892, will be found a description in detail of all the features of this venerable Cill, but a notice of its characteristic doorway may very fittingly be here reproduced: - It occupies a position in the centre of the west gable, is flat-headed, a splendid example of its class, measuring 6 feet 1 inch in height, by 2 feet in breadth, at the top, and 2 feet 4 inches at the base. In one respect this doorway is very remarkable, presenting, as it does, what Bishop Graves would style a "Greek cross," carved in relief upon the under side of its lintel (see fig. 4, p. 409). Only one other instance of the kind, as far as I know, can be pointed to, although at Fore, in the county Westmeath, Inismurray, county Sligo, and elsewhere, the sacred emblem may be seen sculptured over the opening on the exterior of the wall. A cross of the St. Andrew type occurs on the nether side of the lintel of Our Lady's Church, Glendalough, a structure, which there is reason to believe was erected by St. Kevin, himself, and in which, according to tradition, he was buried. In Comte Melchior de Vogue's exquisitely illustrated work on the "Architecture of Central Syria " (a copy of which may be seen in our National Library) will be found engravings of a considerable number of crosses which occur carved over the doorways or on the friezes of churches and monastic buildings of that country. These crosses are wonderfully like those which we find similarly placed upon portions of several of our earlier, if not earliest, Irish churches. So much for Killiney Church; but before leaving, visitors should search for the rude and very ancient stone font (see fig. 5, p. 409), which probably still remains, though I could not find it when examing the ruins on a recent occasion. Not many years ago, the time-stained teampull or cill under notice was approached from the main road by a rude "boreen" on the left-hand side of which stood a hoary thorn tree, which must have been several centuries old ; beside it was a carn, station, or altar, like those one sometimes meets with in the south or west. Both were considered by ancient people of the neighbourhood as very sacred. Alas! they have totally disappeared before the march of "improvements" as has also the original "Mur" or well-marked earthen rath by which the venerable cemetery was environed. Instead of this we find a hideous stone wall, built in the style usually adopted by the taste and feeling of Poor Law Guardians, who, all over the country, are destroying every trace of the picturesque which remained with our ancient parish churches. NOTE ADDED IN THE PRESS. Happily the font of Killiney Church has been found, and may be seen within the nave of that venerable cill. JRSAI VOL. VI. FIFTH SERIES (VOL. XXVI. CONSECUTIVE SERIES), 1896, 409-411; 418. Omnium Sanctorum Hiberniae finally has its own Facebook page - hope to add regular updates. As this is the beginning of March, below is a 1921 article on some of the saints whose feasts occur within this month. Not surprisingly Saint Patrick is the first saint the author, 'Magdalen Rock', a pseudonym of County Tyrone woman Ellen Beck (1858-1924), deals with and she presents the traditional view of our patron as the all-conquering national apostle. I am always interested to see which saints are selected by writers at different times, here we have not only the well-known Saints Patrick and Ciarán of Saighir, but the lesser-known Finian the leper as well as two missionary saints of European fame - Frigidian and Fridolin. Interestingly, the article ends with the English saint Cuthbert, whom various Irish writers of that era were keen to claim as being of Irish descent or birth. 1921 was of course a rather momentous year in Irish history and the chance to claim that one of the greatest of England's saints was really an Irishman doubtless acquired an added piquancy! ST.PATRICK'S place of birth was for long a matter of dispute among learned men; but the most painstaking of authorities now agree that the future apostle of Ireland was born at Kilpatrick, near Dumbarton, in Scotland, where the Saint's father, Calphurnius, was engaged in some service for his country. The Saint's mother was Conchessa, a sister, some say, but at any rate a close relation to, St. Martin, Bishop of Tours. To this day certain little religious customs are common to the natives of some parts of Ireland and the people of the French diocese. So much has been written of St. Patrick that one need not enter closely on the events of his long life. He was carried off by some marauding bands of Irish when only sixteen years of age and, on his arrival in Ireland, was sold as a slave to an Antrim chief named Milcho. During the six years of his toilsome captivity he prayed hundreds of times daily, as he himself tells, and his love and fear of God increased more and more. As he herded the sheep of his master on bleak Sleamish he acquired a perfect knowledge of the Celtic tongue, which was to prove of incalculable value to him in the far-off years. Probably he learned something of the pagan rites of the Druids. When this knowledge had been gained he was told by an angel to seek the sea-coast and return to his parents. Though quite ignorant of the way he at length reached the western seaboard, and at some port found a ship about to sail. The captain refused to give him a passage, but when the vessel put to sea it was several times blown back to land. The unusual circumstance induced the captain to offer the strange youth a passage; and, once Patrick was aboard, the sails filled. Soon he was welcomed by his relatives, who had given up hope of ever meeting him. One can imagine the joy of the mother, whose many other children have obtained places in the Irish festiologies. Conchessa is venerated as a saint, and is the patron of the wind-swept Island of Valentia, off the coast of Kerry, and the point from which the American cables are laid. Patrick's great desire was to become a priest, and he studied first with his uncle, St. Martin of Tours, and then with the learned and famous monks of the Island of Lerins, in the Mediterranean Sea. Later still he became one of the disciples of the great St. Germain of Auxerre, and it was from the hands of this prelate that he received the dignity of the priesthood. It is a commonly accepted tradition that he accompanied the Bishop to Britain and witnessed the famous Alleluia victory. It is, also, said that he visited the tomb of St. Alban and the monks of Glastonbury. But ever and always Patrick heard the voices of the Irish calling him. At last, by the advice of the holy Bishop, he set out for the Eternal City, where Celestine filled the Papal chair. 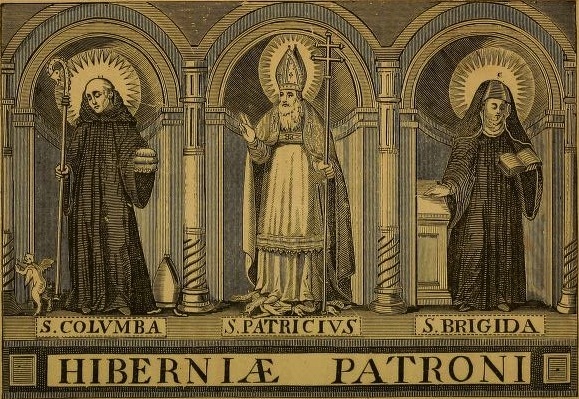 Before this Palladius had been sent to convert the Irish; but Patrick received the blessing of the Pontiff and many precious relics, and departed from Rome on his mission. On his journey he heard of the death of Palladius and turned aside to Turin, where he received episcopal consecration from the hands of St. Maximus. Then he sought his tutor, and, fortified with the advice and blessing of Germain, he set out for the land of his captivity. In Ireland his long mission was, from start to finish, an unbroken success. Not that he escaped trials and even dangers, for once we are told his death was planned, and he was saved by his faithful charioteer, Odran, taking, unknown to the Saint, Patrick's place. With this solitary exception the Irish nation received the faith of Christ without bloodshed or violence. Patrick failed to land in Wicklow, but after two or three attempts one was at the mouth of the Boyne, where he wrought his first miracle he made his way to Sleamish, seeking his old master. On his way he was stayed by a chief named Dichu, but the arms of the chief became rigid, and their action was restored only by Patrick's word. The chief gave the Saint his barn, where the Divine Mysteries were celebrated. The old master of the Saint proved obdurate to the pleading of his former slave, and finally perished in the flames of his house. It was on Easter Eve, 443, that Patrick reached the Hill of Slane, and just opposite, on the Hill of Tara, the high-king, Laeghaire, had gathered Brehons, and Druids, and chieftains, in order to celebrate his birthday. A royal proclamation had been sped that no fires should be lighted in the land till the glare of the first fire should show at Tara. Patrick lit his Paschal fire on Holy Saturday, and the Druids rose in terror. ''If that fire be not extinguished it shall live for ever," they said, and the king sent a guard to bring Patrick to the palace. Evil, too, was plotted against him. Twelve soldiers were concealed on the way Patrick would come, but as the Saint passed their eyes were blind. Yet they saw naught but the lambs at play. When the Saint and his companions were seen approaching the king issued a command that none should rise to do honour to the strangers. In spite of this two among the crowd rose. One was a page named Erc, the other was the chief bard, Dubtach. Should from first to last to the Cross be true. Then Patrick spoke to the vast assembly, and, in discoursing on the Trinity, plucked the little shamrock, which is still Ireland's emblem, to illustrate his remarks. The king would not forsake his old gods, but he gave the newcomer full permission to preach and teach. His own two daughters, Ethnea and Fethmea, were baptised, and passed in their baptismal innocence to Heaven. For over sixty years the Saint laboured incessantly to spread the Faith through the island. Soon after leaving Tara he touched the great pagan idol, Crom Cruach, with his staff and it fell to pieces. This idol had been erected centuries before by a king and was venerated greatly by the people. King Cormac, though, had in his reign probably acquired some knowledge of Christianity, and had disapproved of idol worship.
" Crom Cruach and his sub-gods twelve,"
Had worthier of your worship been." This wise king had died prior to the coming of the Irish apostle, but he had ordered that he should not be interred with the pagan dead, but at Rossnaree, facing the east. His people took his words as the ravings of the sick, and bore the kingly corpse to the banks of the Boyne for interment. But the river rose in flood and, strive as they might, the bier escaped their sinewy hands and drifted to Rossnaree. Entombed it in the peaceful ground. But of the Patrician legends not one is more beautiful than that of the baptism of Aengus, the King of Munster. St. Patrick performed the ceremony with the Staff of Jesus - a staff or rod said to have been used by the Saviour, and given by Pope Celestine to Patrick when leaving Rome - in his hand. Inadvertently the Saint placed the sharp spike of the staff on the king's foot. When Patrick saw the ground red with blood he cried in horror, and asked the newly-baptised monarch why he had kept silent. Aengus replied that he thought the piercing of his foot part of the baptism in slight reparation for the sufferings of Christ. Manghold, who in after life was Bishop of the Isle of Man, was a robber chief who had gathered around him a wild and turbulent band. As Patrick once journeyed through Ulster the chief heard of his preaching, and at first thought of putting the Saint to death. On reflection the robbers thought they should find more amusement in playing a trick on the stranger. They placed one of their number on a bier as if dead, and waited on the road for the arrival of the Saint. When Patrick came they begged that he would restore the seemingly dead man to life, but the Saint was made aware of their plot and moved on. The covering was removed from the bier, and the robbers were astounded to discover their comrade really dead. They followed Patrick and, kneeling at his feet, implored him to pardon them for what they had done. The Saint forgave them, and, going back, restored the dead robber to life. The chief of the band became a Christian and besought Patrick to give him a severe penance; and finally the Saint, understanding that great grace was at work in the sinner's heart, told Manghold to divide his substance among the poor, and, proceeding to the coast, enter a boat that he would find there. Then he was to manacle his feet and lock his chains. The key he was to throw into the sea. The repentant robber obeyed, and the rudderless boat drifted to the Isle of Man, where two holy missionaries lived. On the day that the manacled chief reached the island one of the missionaries had found a key in a fish which he had opened for the evening meal; when the missionaries later discovered a bound man in the rudderless craft they remembered the key. It immediately unlocked the iron bonds, and Manghold told his story and began to share their prayers and austerities. In course of time he was ordained priest and, on the death of the Bishop of Man, he was compelled to become the Prelate of the little principality. In confirmation of this strange story the ancient arms of Manxland bore on one of their quarterings a small boat bearing a pilgrim, and overhead a key and glistening star. The long vigil of prayer and penance kept by St. Patrick on Croagh Patrick is recalled yearly by the pilgrimage to that mountain. While he fasted and prayed he won many graces for the Irish people; often the angel Victor told Patrick that God could not grant his requests, but the apostle persevered till his prayers were granted. He himself shall be the judge of the men of Erin at the Last Day. St. Patrick died at Saul his barn-church on the seventeenth of March, 493. At the last he was troubled lest the people he loved should fall away from the Faith of Christ; but an angel came to assure him that his apostolate should never fail. To the uttermost ends of the earth his children have carried the Faith; the Irish priests have preached and taught in all lands ; and Ireland may well be called "the light of the west." The Saint's remains were interred in the chief's dun near Saul, where subsequently rose the Cathedral of Down. The shroud he wore in death was spun and woven by St. Brigid. Another Irish saint who is commemorated in March is the one known variously as Finnian, Frigdian, and, in Italy, Frediano. He was born at the end of the fifth or the beginning of the sixth century in Ulster, and received his early education in the monastery of Nendrum, on an island in Strangford Lough. The monastery had been founded by St. Mochal, of whom a beautiful legend is still remembered. Once this Saint went out to collect firewood, and, as he gathered bush and brake, he thought much of Heaven and its joys. Suddenly a bird began to sing the sweetest song, and Mochal listened till the song was ended; then, taking up his load, he returned to his monastery. But the rush-roofed dwelling was strangely altered, and the monks that met Mochal were all strangers. He told that he had been away a little while gathering wood, and at length an old, old monk recollected that he had in his youth heard of a former Superior of the house who had gone out on some errand and had never come back. That monk, investigation proved, was Mochal, who had learned something of what the bliss of Heaven might be from the song of a bird. From the Irish school Finnian passed to Candida Casa, in Scotland, and there he "heard so much of the beauty and splendour of Rome and its shrines and churches that he set out for the Eternal City, where he was received kindly by Pope Pelagius, who placed him under the charge of the Canons Regular, to acquire knowledge of ecclesiastical laws and apostolic customs. When he left to return to his own land he carried with him a copy of St. Jerome's corrected Vulgate and the Rules of the community he had lived under. From this manuscript Columba made, by stealth, the copy that Finnian claimed as his, and which led to a bloody battle and the subsequent exile of Columba to Iona. The manuscript transcribed by Columba is at present in the Royal Irish Academy, Dublin. Many miracles are preserved of the Saint. When he had founded his monastery at Moville it was seen that no stream was nigh for supplying the wants of the community. The Saint prayed, and from a spring on a hill near the waters flowed and gathered to gether, till they furrowed a bed and flowed past the monastery. Marianus Scotus, the pride of Fulda and Mayence, was a pupil of this monastery, as well as Columba. Filled with the desire of making converts, the Saint passed to Scotland, where memorials of him yet remain ; finally he went to Italy, and settled near Lucca, to spend the remainder of his life in penance and prayer. Such was not to be. The Bishop of Lucca died, and warfare, famine and plague had left the district in poor plight. Pope John III. Knew something of the Irish hermit, and Finnian was obliged to quit his retreat and take up the laborious work of the diocese. For the lengthened period of twenty-eight years he toiled valiantly, and passed to his reward in the March of 588. The miracle of the turning aside of the River Serchio is the subject of a fresco on one of the walls of the Cathedral of Lucca. Once when the melting of the wintry snows of the Apennines had swollen the river to such an extent that the ruin of the fields and vineyards near the town seemed imminent, the Bishop, after prayer to the Almighty, took a rake and marked out a new course for the turbulent stream. The river miraculously followed the course indicated by the holy Bishop. On the sixth of March the Church honours St. Fridolin, the sixth century founder of the monastery of Sackinger, Baden. Fridolin first laboured as a missionary in his native Ireland, but later passed into France, where he erected a church to St. Hilarius, who told him in a vision to repair to an island in the River Rhine. Clovis gave him a gift of the unmentioned isle, which the Saint recognised when he beheld Sackinger. There he founded his monastery, which continued to be an important foundation down to the ninth century and after. The Saint is the titular patron of the Swiss canton of Glaris. The feast of St. Kiaran, or, as he is called by the Britons, Piran, is on the fifth of the month. He is said to have been born in Cork towards the middle of the fourth century, and, having acquired in some way a knowledge of the true Faith, he went to Rome when he was about thirty years of age. There he studied, and there, Irish writers say, he was ordained. Indeed, some authorities assert that he was raised to episcopal dignity in Rome, though others say that he was consecrated a Bishop by St. Patrick. At any rate he preached and taught in his own locality, and had the joy of giving the religious veil to his mother. When very old he retired to Cornwall, where he lived an eremitical life, the better to prepare himself for death and judgment. A Cornish town yet bears the name of the Irish Saint, whose mode of life induced many disciples to join him in his last years. St. Finian, surnamed the Leper, to distinguish from other saints of the same name, was son to a Munster king. He studied under the care of St. Brendan, and in later life founded the famous Abbey of Innisfallen, which stood on an island of the same name in one of the beautiful lakes of Killarney. He founded other houses, and bore with patience and resignation the grievous malady from which his surname was given him. His memory is commemorated on the sixteenth of March. Such undisputed authorities as Cardinal Moran, Archbishop Healy and Canon O'Hanlon say that St. Cuthbert, the apostle of the Lowlands, was certainly not only of Irish descent, but of Irish birth. His mother crossed over to Scotland while Cuthbert was very young, and the boy earned his bread by tending sheep near the monastery of Melrose. In his youth he had a keen desire to become a monk, but the troubled state of the kingdom of old Northumberia caused him to become for some period a soldier. However, he in time joined the community at Melrose, and soon became eminent among the novices for his holiness, and for his efforts to amass learning. When the monastery of Ripon was founded he was there as guest-master, but he, along with other Irish monks, returned to Melrose when the vexed question of the Roman usage in keeping Easter came up. Many stories are told of his gift of instructing the hardy peasants of the northern realm. Once one of the listeners told him of the impossibility of continuing his missionary journey. ''The snow blocks the way By land, the storm the way by sea; but the path to Heaven is still open," Cuthbert said. No labours tired him, no dangers daunted him, no untoward happenings appalled him. He succeeded Boisil as prior of Melrose, and when the Synod of Whitby accepted the Roman time for Easter he sadly agreed, and became prior of the island monastery of Lindisfarne. There he loyally supported St. Wilfrid in introducing the Roman customs ; and the fact that one so famous for sanctity and for attachment to the Celtic usages did this was of great help in settling the question of Easter and the tonsure. In the desire of attaining greater perfection he, after a time, retired to a little islet near Lindisfarne, but, after a long resistance, he was consecrated Bishop by Theodore, Archbishop of Canterbury. For two years he acted as Bishop of Lindisfarne, labouring for souls unceasingly. Feeling death was nigh, he begged to be relieved of the cares of his See, and again retired to his lonely retreat. He received the last Sacraments from Abbot Herefrid, and died on the twentieth of March, at the same moment that his friend, St. Herbert, passed away. Scott, in Marmion, has written much of St. Cuthbert, and of the wandering of his relics in search of sepulture. At first his bones were laid to rest at Lindisfarne, but, when the Danes came to burn and pillage, the monks carried the holy relics of their Saint with them in their flight. Seven years St. Cuthbert's corpse they bore. The monks would fain have buried the holy remains at Melrose, but the stone coffin floated downward. Nor would it rest at Ripon or Chester-le-Street. But a miracle indicated that the remains of the Saint should repose in Durham. There they remained in a rude chapel formed of boughs till removed to a wooden, and, eventually, to a stone church. In 1104 the body was found to be incorrupt. In the coffin were some remains of St. Oswald also. The shrine of the Saint was one of England's "holy places" down to the evil days of the Reformation. Ere the shrine in 1542 was robbed of all its treasures the monks had removed the body of the Saint and deposited it elsewhere. Scott speaks of the tradition that the secret of its burial place is known to the Benedictines, who pass the secret on from one generation to another. Several learned divines have expressed opinions one way or other. Some conclude that the remains of Cuthbert and Oswald are in the present Cathedral of Durham, while others hold different views. In the College of St. Cuthbert, near Durham, where most of the priests of the North of England are trained, the episcopal ring of the Saint is to be seen, with a bright sapphire glistening from the gold.